First off, the ‘Laughter Nuit’ bottle is minutely sleek and beautiful; not show off’y beautiful but discreet, discerning, statement, subtlety. It’s slightly curved squareness is tactile and smooth to touch and the round silver cap sets off the silver tag label and the dark aubergine glass that verges on just the right side of black. You can tell this has been designed to sit on a bathroom shelf and look beautiful. Space NK certainly knows how to sell an image and is expert in choosing niche fragrances for discerning fashion divas to try out, but what of their own offering? It surprised me as it smelled distinctly masculine on first spray. Woody earthiness and sultry purple blackness seep through in cedar, musk and incense, although the latter isn’t as strong as it could be as I like a good old overdose of heady incense. What comes through later is a subtle sharpness to the senses with grapefruit and bergamot and a strong back note of violet and cinnamon. The scent belies itself with a freshness that isn’t obvious and takes a little getting used to. The feel is of night time meanderings that would suit 21st century hippy souls who, despite themselves, embrace minimalism rather than the exotic bazaar approach of trinkets, colour and ornaments. The real surprise is that it wouldn’t faze me in the least if a gentleman choose to opt for for this fragrance. It lends itself well to either gender. All you need is the chutzpah to carry it off. 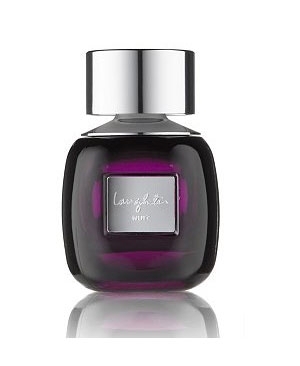 Laughter Nuit is available as part of a collection at http://www.spacenk.co.uk/ Laughter Nuit EDP (50ml) is £45, Bath and Shower gel is £22, Body Cream is £36 and Body Lotion is £24. Next post: Avon calling. And she looks fabulous in her Luxe Lace.